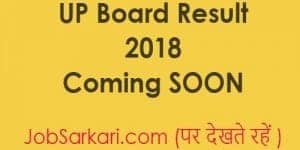 The Uttar Pradesh secondary and higher board of education has conducted the board examination successful in 2018 like the previous years. The examination has been conducted peacefully through the state. The candidates have easy access to check the result from the official website of the state education board. As already known, the 10th board examination was conducted from 6th February 2018 to 22 February of the same month. These days, the students can also register for the results on the official website or on a particular number to receive both the text message and the email of the results. As per news, it can be said that the examination papers were checked under strict invigilation. The UP board accomplished the procedure fast to declare the results on time. Considering the 10th and 12th standard, near about 66.37 lakh candidates appeared. Among this number 29, 81,387 students appeared for the 12th examination and 36, 55,691 took the 10th board examination. As per news sources, it is also said that the examination centers were well equipped, and they installed the CCTV cameras. The examination went smoothly without any violation of rules in between the examination. Neena Srivastava, secretary of the board, was of the opinion, that arrangements were adequate for the examination and question papers reached the examination centers following tight security.As of 2018, 500 teachers have been deployed for evaluation of the copies. Besides, near about three lakh invigilators have been allotted to conduct the examination. In this regard, the Yogi Adityanath government promised to ensure that there is no copying in the examination. It is for the first time in the history UP board examination that CCTV cameras have been installed in the examination centers. The UP secondary board education has been successfully examining since 1923. The first-ever examination was conducted with a head count of only 5,655 students appearing for class 10 examination and only 89 students for the intermediate 12th standard examination.According to reports, the pass rate among the candidates has increased in the last year, and it is expected to increase more this year. Both the results of class 10th and 12th are expected to come out in the middle of May 2018. The percentage of successful candidates was among the girls and boys as per last year’s statistics. Some strict measure has been initiated by the Yogi Adityanath-led government to check illegal cheating in the examination. On account of these measures, it has been found that there were more than 1.5 lakh students absent on the very first day of the board examination. However, even after deploying the strict measure, near about 6 lakh students left the examination and 1,900 examinees were found copying. The main aim of the UP examination council was to prevent the education mafia from cheating in the examination hall. To check the unfair means, a strict measure was adopted by the education board. Anyone found copying or promoting the practice would be dealt with strictly. The strict measures also include checking the students before they enter the examination hall. It required appointing administrative officers who were to maintain prohibitory orders within a close area of the examination hall. In this regard, it can also be said that there has been a reduction in the dropout rate of candidates appearing for the English paper and Mathematics paper on the first day of examination for class 10th and 12th respectively. Also, 13 FIR has been lodged against the principals, invigilators from some of the examination halls.